It has a CD player that can play DVDs, DIVX, MP3 MP4, photos and all kinds of formats. Touch screen 7" allows you to take full advantage of its features with an intuitive interface and easy to use . Its GPS module running on a platform Android, lets you navigate with ease and make you aware of the presence of cameras. There is also a USB input and a video input and 1 video output , allowing you to connect a reverse camera , game console or other video sources. It also has two audio outputs for amp. Install the radio and connect to the power supply , speakers and devices. 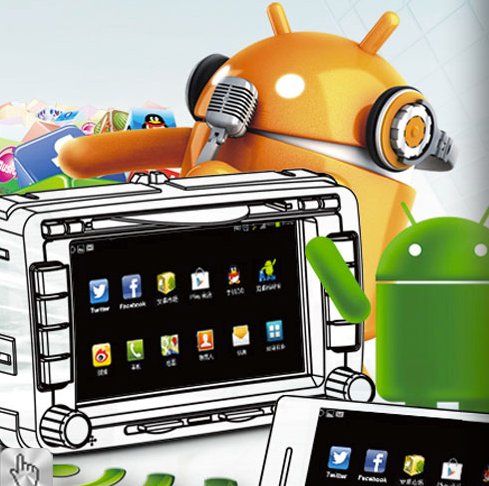 radio running the Android operating system, such as smartphones. Includeuses that were far more a matter of computing: Google Maps, voice search, location, etc.. The strength of this system lies in access to online services. To qualify, you must have a 3G connection. A slot for a USB key provided with the SIM card is provided, the device has four USB ports: one for the 3G, one forsatellite antenna, one for the iPhone or iPod and a USB port for female,which can be used to connect a USB stick or hard disk up to 1000 GB. 16GB internal memory. Then you can read without using the cd . Replaces a conventional CD changer (No need external charger ) . Do a quick save (about 5 minutes for a CD) or back while listening to the CD (about 15 minutes). Enjoy the " Picture in Picture " . You can continue to display the GPS or bluetooth on the entire screen while a window display a DVD , TV or any other source. You can control the radio from the steering wheel . SD . Accepts SD card up to 32GB ID3 ( MP3: Name the artist, album title , song title ) . Ipod control. Connect your iPod / iPhone and drive it from the screen of the receiver . You can recharge at the same time . Bluetooth handsfree kit will allow you to communicate with ease and safety , the unit controlling the basic functions of your phone, it allows you to answer and dial a number on the touch screen of the receiver , the microphone is integrated . Bluetooth connection to any mobile phone equipped with Bluetooth. Microphone in front for hands-free calling .Conversation through the speakers of the car. Compatible with A2DP ( stereo music via bluetooth ) Caller ID , redial, hang up and stall , depending on mobile phone directory mode. Intuitive graphical interface. Order via the touch screen. Original remote driving with auto -learn commands . Resumption of steering wheel controls. It is revolutionary and will allow you to have a high-end equipment in your vehicle, at a competitive price.